Congratulations to Robert Tietje of White Lake, Mich., DCI.org's Fan Appreciation Giveaway winner for the week of Wednesday, Jan. 24. As a randomly selected winner, he won a 2006 Division II & III World Championships CD. If you'd like a chance at winning the next Fan Appreciation Giveaway, get in the know with DCI.org's award-winning e-mail newsletter, DCI.now. 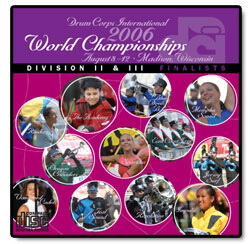 Buy this CD from the DCI.org online marketplace.